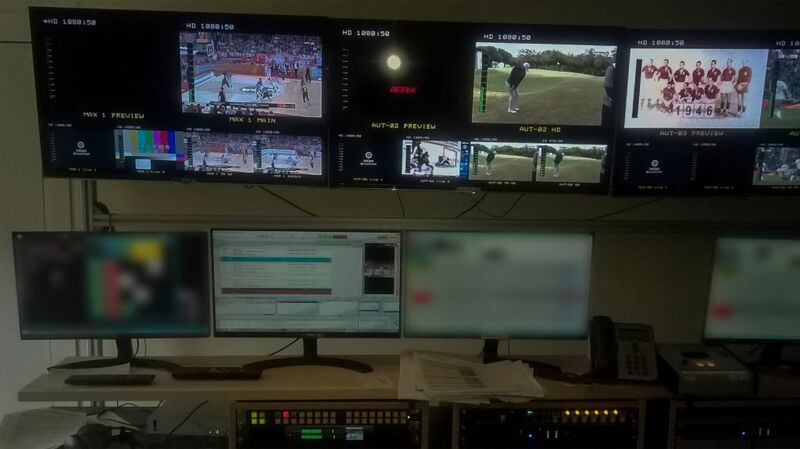 Case: A1 – the oldest and leading telecommunication company in Bulgaria needs a playout for its new sport TV channel. The Sport TV is probably the most difficult type among all types of TV channel – the broadcasting of sport events on live leads to constant changes in the planned program, requires to use a lot of virtual files (files that are planned in the playlist, but are not ready and their duration could vary), etc. One of the key requirements is a real 24/7 reliability, which is monitored via the Client`s monitoring system that fires an alarm if the TV channel is frozen/missing for more than 3 seconds. Solution: The 2 playouts delivered by DV Play work in Redundancy mode 1:1 (Master – Slave mode). The redundancy is provided with reading the status and switching of a Nevion Viking switcher 64×64. An important part of the solution is the FileManager – a file copy solution that copies the scheduled video files from a NAS server locally on the playout. The playlists are imported using XML provided from an external traffic solution used for making the daily playlists. The solution was delivered for 1 month and the TV channel was on-air on the planned date. Soon a new 4K TV channel will be started and it will use the DV Play solutions for all activities– playout, ingest and playlists will be created by our traffic system – Ads Schedule Pro. We know for long time the company DV Play and ask them to provide a better solution for a new Sport TV. The playout we sold last 10 years was a good one and well known in the broadcast industry, but we were searching for a solution that could provide better features and lower budget. The workflow in the Sport TV channel we manage is very complex and the list with requirements is big, but DV Play covers all of them. Some of the requirements were extended during the implementation, but DV Play team has shown its professionalism and experience and solved all the issues. We are very happy with the level of support provided by DV Play and looking forward to use DV Play solutions for our new 4K channel coming soon.